Change of Weekends in 2019! We are now holding the Tour des Lakes July 20th, 2019! 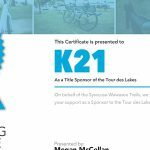 Sponsor the Tour des Lakes! Would you like to sponsor the Tour des Lakes? Get your business out there to the Syracuse – Wawasee Community and beyond! You can apply right on this site. Click below to find out more. Join us for the 9th annual Tour des Lakes bike ride, a leisurely bike ride around eight beautiful lakes in Kosciusko County. There are three route options; 25k, 50k and 100k. The 100k is our most popular route and guides riders around several beautiful lakes, including Lake Wawasee, Webster Lake, Chapman Lake, Winona Lake and Tippecanoe Lake. Between the lakes, you will enjoy a stunning ride across the country-side and through quaint small towns. There will be SAG stops for a quick healthy snack and drink, and lunch when you return to the Community Center. A portion of the proceeds are used for the continued growth of the Syracuse-Wawasee Trail system. What do our riders have to say? Thought this would be fun to try. Had friends come in from Chicago to go with me. We enjoyed it. Our friends enjoyed seeing the lakes and country side. Plan to do it again next year. This was our first Tour de Lakes ride and we found the route to be absolutely breathtaking!! We rode through the countryside of so many beautiful lake communities and were in awe of the stunning views!! The hosts at the SAG stops were helpful, informative about the areas we were in and sent us on our way refreshed not only physically, but mentally as well!! This is a very well-planned ride with signage that got you right where you needed to go. We had no idea you could ride such a local route and be privy to some beautiful lake shores!! This will be an annual event for us. This is a beautiful ride through lake country, supported by very friendly and helpful people. Great ride year after year! Those two last hills get me every time! Loved the scenic ride! Very enjoyable & everyone was very friendly & helpful! Saw deer & loved going around the lakes! Even ran into people I knew golfing at Tippy! A great ride! Plenty of scenery and challenges along the way. But you're never far from a SAG. Beautiful scenery, challenging course and great food!! One of the best rides in the area. A few rolling hills to keep it interesting and lovely scenery. This is a great ride. Very well organized! Very friendly & helpful people! Great SAG stops with very nice people!! Well run, good route. Some challanges that keep it interesting. Very nice scenery during the ride and you get to see a lot of lakes on the 100 k route, and the food after the ride was awesome. Well worth the money if you're a true bicyclist and are looking for a change of scenery from just riding around your local area. Wonderfully organized, beautiful shirt, perfect day, best ride of the year. There are a lot of different ups and downs that makes it great! 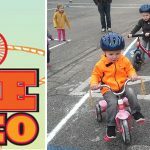 Proceeds from this event help build and maintain the Syracuse-Wawasee Trail system. Click the button below to learn more about sponsorship opportunities!